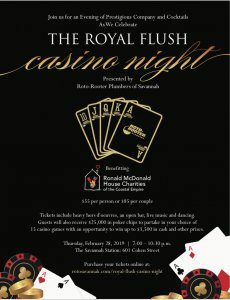 (SAVANNAH, GA) Roto-Rooter Plumbers of Savannah will present “The Royal Flush Casino Night” on Thursday, Feb. 28, at the Savannah Station, 601 Cohen St., with all of the proceeds going to benefit families at the Ronald McDonald House of the Coastal Empire. The casino-themed party will feature heavy hors-d’oeuvres, an open bar, live music, dancing and complimentary casino. Individual tickets for the event are $55 and $85 per couple. Festivities begin at 7 p.m. Guests can “go all in” to support this event, which will feature Black Jack, Roulette, Craps, Texas Hold’em and Wheel of Fortune with the opportunity to win up to $3,500 in cash and other prizes. Each guest will receive $25,000 in funny-money chips when they arrive but will be able to get additional chips throughout the evening for a suggested donation. The idea is to build your winnings. At the end of the event, after the tables close, prizes will be awarded by random drawing with winning chips being used to buy tickets for the drawing. The greater your winnings, the more tickets you may buy. For more information, contact Chris Krauss at 720-982-8779. Ronald McDonald House Charities of the Coastal Empire is a registered 501©3 non-profit that operates solely on donations. The cornerstone program is the Savannah Ronald McDonald House that provides more than 4,170 family night stays each year with a “Home away from home.” Other core programs include the Ronald McDonald Family Rooms in St. Joseph’s/Candler Hospital and Children’s Hospital at Memorial Hospital Medical Center and the Ronald McDonald Care Mobile, a mobile dental clinic providing free dental cleanings and examinations, care to underserved, school-aged children in Beaufort County, S.C.